The Steam Windows version uses Denuvo Anti-Tamper DRM (unknown for Microsoft Store version). The Mac and Linux versions of the game do not contain Denuvo. The Linux version is considered a great port with a small performance gap compared to Windows counterpart. Digital Deluxe Edition includes Season Pass. Save games are not compatible between Windows and OS X/Linux. 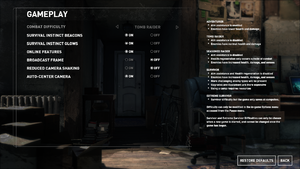 Launcher display settings (Steam version). 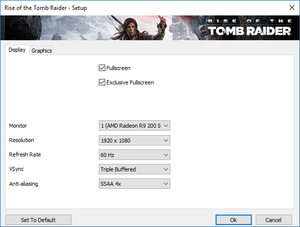 Launcher graphics settings (Steam version). 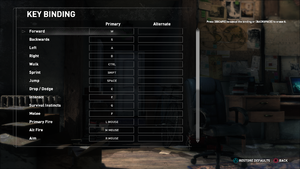 In-game general settings (Steam version). 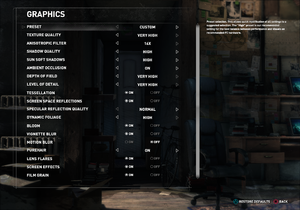 In-game display settings (Steam version). 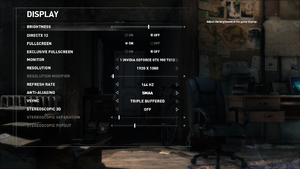 In-game graphics settings (Steam version). See the WSGF topic (Steam version only) or use Cheat Engine table. Disable Exclusive Fullscreen for the Steam version. Microsoft Store fullscreen is borderless. FXAA, SMAA or up to 4x SSAA. PC Patch 1.0.668.0 (Patch #7) has disabled forced v-sync from the Microsoft Store version. Pre-rendered cutscenes run at 30 FPS. Xbox One X only. PC version created but never released. Nvidia VXAO (Voxel Accelerated Ambient Occlusion) is only available in DirectX 11. In-game input settings (Steam version). 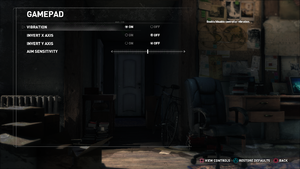 In-game controller settings (Steam version). In-game controller buttons (Steam version). May need to skip launcher. Also x-axis, as well as individually for aiming and free-look camera. Microsoft Store version supports Xbox One Controller Impulse Triggers. 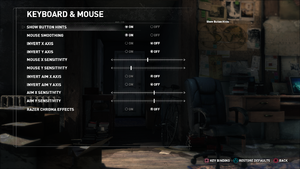 In-game audio settings (Steam version). Regular white or colored according to speaker. Cutscenes and some of the gameplay, enabled with subtitles. Dolby Atmos is only available on the Xbox One version. Side-by-side, AMD HD3D (Steam only) and Windows DXGI 1.2 Stereo 3D (Microsoft Store only). Steam version only. 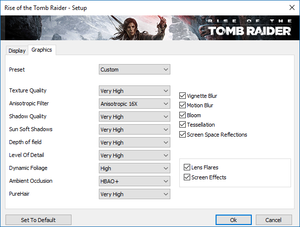 Use Rise of the Tomb Raider - 3D Vision Fix for better support. VR only available in the Blood Ties story in the 20 Year Celebration Pack DLC. During the ending cutscene, the game may crash immediately after Jacob appears with an error message saying that "A problem has occurred with your display driver." If that cutscene is skipped, the game may crash immediately after selecting "Continue" at the main menu. The first time you play the game after finishing the main story, there will be a short conversation between Lara and another character; after this conversation, DX12 can be safely re-enabled. FPS may be very low even on a high-powered system after crashing with an error message saying that "A problem has occurred with your display driver." You may need to remove "-nolauncher" from your Steam launch options to re-enable Fullscreen-Exclusive mode. There is no sound being played in the menu and the game itself (but sometimes in cutscenes). When starting steam and then the game from a terminal the message ALSA lib pcm_dmix.c:1099:(snd_pcm_dmix_open) unable to open slave is printed among lots of other output. On Arch Linux, install the pulseaudio-alsa package. On other distributions, copy the one file this package contains to /etc/asound.conf (requires root/sudo access) or to .asoundrc in the users home directory, content here. 11, 12 Toggleable from launcher or settings. Vulkan compatible GPU is required, along with the driver and the loader. For Nvidia users, you will need to use the latest Nvidia 396.18 beta driver. For AMD users, you will need Mesa 17.3.5 or better, However, if you are using a Vega GPU you require Mesa 18.0 or later. AMD GCN 1st and 2nd generation graphics cards are not supported, Intel GPUs are also not supported. 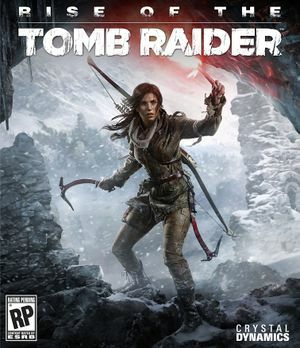 ↑ SteamVR support for Rise of the Tomb Raider “Blood Ties” story chapter now available! This page was last edited on 30 March 2019, at 03:18.